I don’t see my family on those passenger lists. Are there more? My grgrandmother Bridget Noon (e) , father Michael Noon and mother Margaret Gannon. Bridget was born Mar 21 (grave says 1867 but every census is different). Sister Mary born 1860. Bridget married James Dixon in Montreal Sept 23 1884. James Dixon’s father was Thomas Dixon and mother Ann Hogan. Thomas and Ann had died before the wedding. 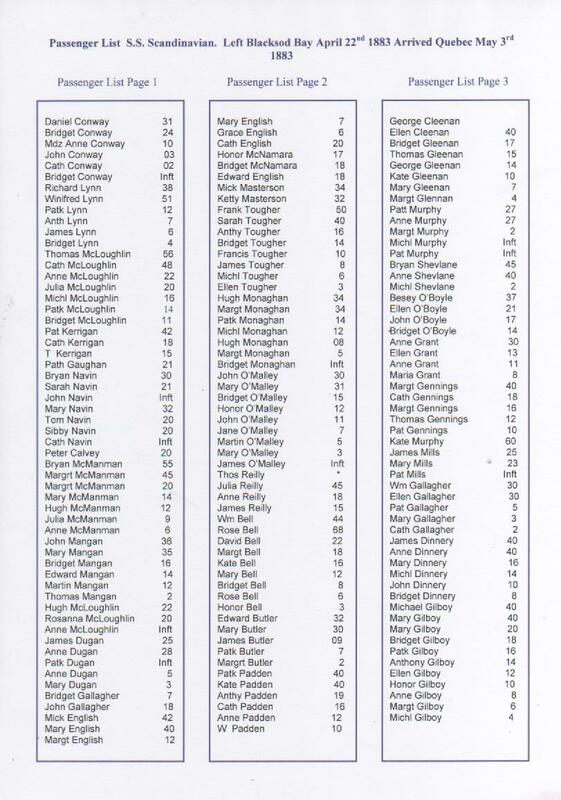 The marriage certificate says James was from one part of co Mayo and Bridget from another part. I though knowing this information I would be able to find exactly where in Mayo my family was from but…nothing. Can you help?